It’s a fact, you need a game plan for your online marketing! Too many businesses are operating “silos” on the web without any real cohesive connection. Your website is run by the web developer or the IT team. Your social media by a social media specialist, and your email marketing (if you are doing it), by yet another marketing person. With each doing their own thing gaps exist. 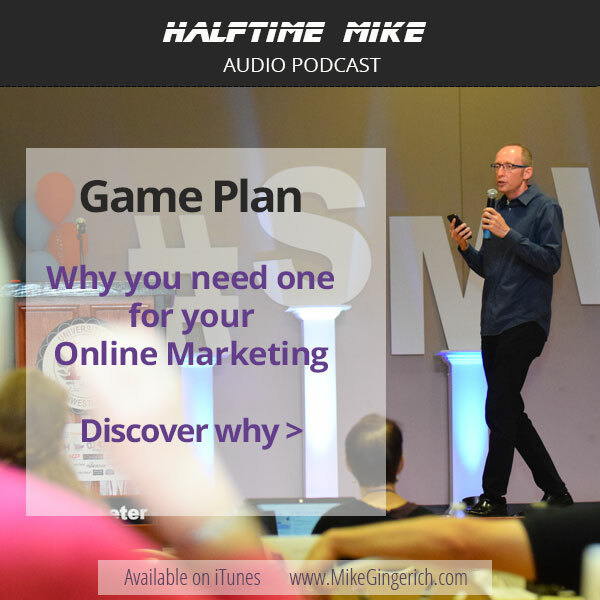 The only way to real results online is to have a cohesive Game Plan. That’s what today’s podcast is all about…. 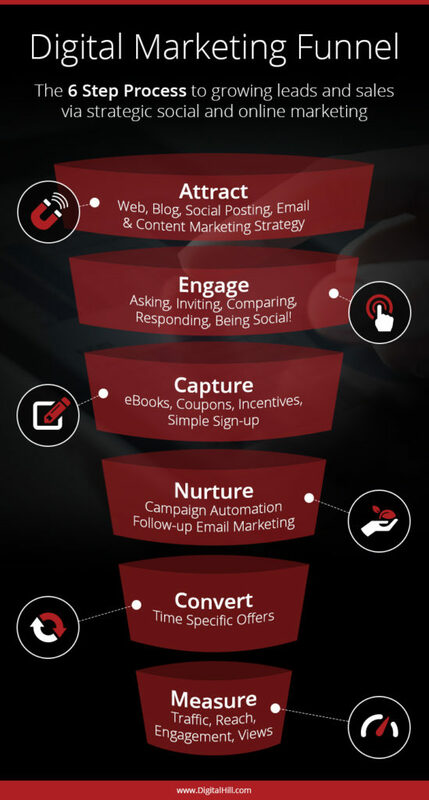 The need for an a introduction to the Game Plan for your Online Marketing and lead generation. It’s about your website, social media, blog, and email all working together in a unified way. Ready to dive into the plan? When you see youth dribbling a basketball down the court in a youth game, you know they aren’t thinking about a team strategy. They mostly dribble around, some are prone to throw up shots from anywhere at any time, and only pass when the coach says “pass.” They run when their parents yell, “keep on moving,” and they keep moving until somebody blows a whistle. Then they stop. Kids don’t have a strategy. Youth basketball players are not thinking about a play or how to setup a teammate in a good position to score. They join a team just because it looks like fun. Or they’re tall. Or their parents tell them to. Their basketball is mostly organized chaos on the court, little bodies moving this way and that, running circles, taking shots. It’s haphazard and random. But they’re kids. Nobody expects much more than haphazard and random. Some businesses don’t have an online strategy. Some business owners approach marketing online in much the same way kids play basketball. They hear social media sites are a trendy way to grow a business online, so they set up a account and wait for something big to happen. Businesses sometimes jump into social media because someone tells them too or they see potential. But, without a social media marketing strategy in place that is cohesive and includes their overall online marketing plan, your social media success will be haphazard and random at best….just like those kids on the basketball court. Social Media has moved from being a trendy way to share your business, to being a business essential. Smart businesses know how to maximize their social media return on investment (ROI). When they invest the time and effort, social media helps build their brands, build trust, and bring in leads that can convert to new business. It’s important to see social media as a powerful tool but a tool that must be connected. It can help you reach your business goals now and in the future. If you’re not a believer, perhaps this can sway your thinking just a little. Facebook gives you plenty of opportunities to market your business. Users spend an average of 40 minutes per day on the site. Social media users check their social media timelines an average 17 times a day in the US and 40 times a day in Mexico, Argentina, and Thailand. Social media platforms, like Facebook, allow you to establish a free presence. All you need is a person to market your company. Social media is a viable tool because it brings so many fans, friends, and followers together in one space. When you use advertising tools, the possibilities are endless! I am bullish on Facebook Ads. They work because Facebook keeps track of our friends, interests, pages liked, comments, places we’ve been to, and other demographic data. They use this incredible cache of information to target ad delivery. It’s a powerful, cost-effective tool that can deliver results. 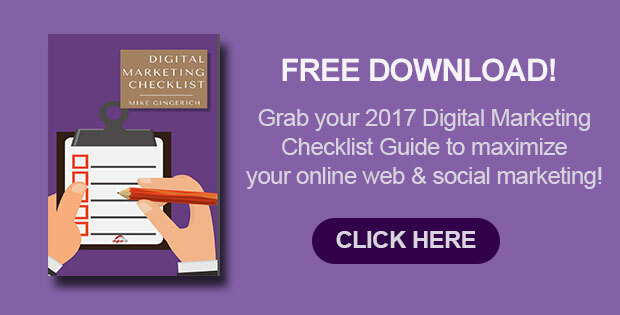 I don’t just push Facebook or a social media plan; you need a comprehensive digital marketing plan! Your website should actively interact with social media and email marketing, so it all works together. A Facebook or social media strategy works just for that silo. True online success requires thinking in a comprehensive, strategic way! Social media users are often just being social or conducting research, not shopping. A basketball team succeeds when the players work together as a team implementing a offensive strategy. Your online marketing strategy works pretty much the same way. For your social media marketing to succeed, your team “players” must work together. Tools to measure your results. If your business has only one or a few of these items, you need to fill in the gaps and connect the dots. You need a package that works together with a unified strategy. That’s what we dive into in the podcasts ahead…a complete plan with specific steps.